After an abominable meal the night before, I desperately needed something good to bring me back. We visited The Mushroom Cap which is a store in town devoted entirely to mushrooms (and includes presumably the world’s only “Mushroom Museum”) and asked the worker what restaurant she recommended. She steered us over to the Half Moon, which specializes in exotic meats. They actually have a menu full of normal items, but when I have the chance to try something I probably couldn’t get anywhere else, I go for it. When we walked in, the place reminded me of the saloon in The Shootist, John Wayne’s final movie. Not western themed, just old school and classy. Everything from the floors to the booths, walls, and bar. It was beautiful, but when we were told they also had a rooftop atrium, we decided to go sit up there. With a view of Kennett Square and a clock tower in the background, it was a nice spot to have a drink. I noticed prices were more than fair especially for a place like this. $4.75 for a pint of Yuengling and $6 for Crispin Blackberry Pear Cider, which my friend loved. He also surprised me by ordering the buffalo meatloaf sandwich (called the “buffaloaf”) topped with cheese, bacon, and mushrooms. He said it was perfect—his favorite meal of the trip. 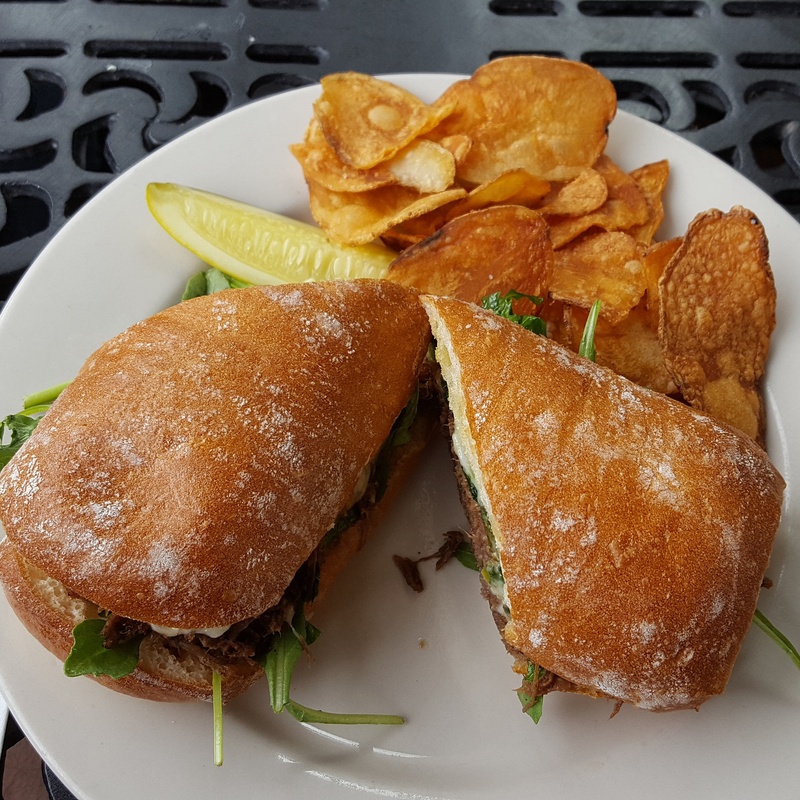 I’ll also have to say that my sandwich was the best meal I had as well: pulled elk with broccoli rabe, arugula, and provolone. The portion size was really big (the picture at the top doesn’t do it justice). They packed a lot of elk into that ciabatta roll. Now, I’ve never had elk before or even deer. The menu says it was slow-cooked for 13 hours. I believe it. The meat was fall-apart tender, no fat in sight, and no gaminess to the flavor at all. Just a nice burst of whatever they used to marinade it. It was comparable to beef, but there was just something else indescribable there that made it different, in a good way. A lot was going on in this sandwich. The broccoli rabe had been sautéed in garlic and oil. You could taste them both. It’s slight bitterness also helped cut through all that meat. The provolone had a sharp bite and the arugula added a peppery hint. Both meals came served with a pickle (I highly recommend you eat this midway through the elk sandwich to clear your palate which will have a ton of meat on it at this point) and homemade potato chips. These were alright. Well-fried, just needed some seasoning. I couldn’t find anything to complain about at the Half Moon. Service was great (we had a waitress and also a waiter in training). Both were very friendly and attentive. As the total opposite of the previous day’s lunch, they left us alone, never pushing drinks. The place wasn’t exactly busy, but we had plenty of time to relax up in the atrium before heading over to Longwood Gardens for hours of walking and exploration. Let’s give them a 4 out of 5 stars. I really loved the menu selection. It ranges from wild and wacky (like camel burgers) to pub grub that anyone would eat. This review was originally posted here. Half Moon Restaurant and Saloon is located at 108 West State Street in Kennet Square, Pennsylvania. Click here to read about my second visit.